Hip or knee pain? Consider these non-surgical approaches to pain relief. Hip and knee pain, two of the most common causes of chronic pain, can be caused by a wide range of conditions, from arthritis to injuries and pinched nerves. 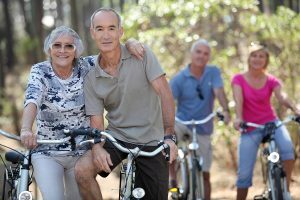 While there are a number of surgical approaches used to treat these types of joint pain, you may want to try non-surgical approaches before considering surgery. The first step is to talk with your primary care doctor or a specialist to find out what the underlying cause of your pain is. Once you have a diagnosis, ask your doctor to outline what non-surgical treatments you can try to reduce your pain and increase your mobility. Weight loss: Being overweight puts a great deal of extra strain on your hip and knee joints, which can increase your risk for arthritis and joint damage. In fact, being just 10 pounds overweight increases the force your knees absorb with each step by 60 pounds. If you’re overweight, your doctor may recommend eating a lower calorie diet that focuses on lean meats and fish, fruits, vegetables, low fat dairy, whole grains, and healthy fats to help you gradually reach a healthy weight and reduce stress on your hips and knees. Exercise: While hip and knee pain can make moving uncomfortable, doing the right types of exercise can actually strengthen the muscles and tendons that support your joints and reduce pain. Before starting an exercise plan, talk with doctor to find out what types of exercise are most appropriate for your condition. Some options may include water-based workouts like swimming and water aerobics, tai chi, and strength training. Your doctor may recommend that you work with a physical therapist, who can tailor an exercise plan to your condition and fitness level and also provide other types of therapy for pain relief, including massage, ice, deep heat, and nerve stimulation. Braces, sleeves, and orthotics: Knee braces and sleeves provide support for the joint, which can in turn also decrease hip pain because you’re not standing or walking abnormally to favor your knee. Orthotics in your shoes can also help reduce knee and hip pain by preventing your feet from rolling in or out and putting extra stress on your knees and hips. Although you can buy these types of assistive devices at your local pharmacy, it’s wise to talk with your doctor first to find out what type of device is most appropriate for you. Medication: Pain relievers, such as acetaminophen and ibuprofen, can provide relief, but talk with your doctor about the potential risks and side effects of using these medications for ongoing pain and what the appropriate dosage is for you. Topical versions of non-steroidal anti-inflammatory medications (NSAIDs) may also provide relief without the risk of gastrointestinal side effects. Injections: Cortisone injections may relieve pain and reduce inflammation in the joint. Hyaluronic acid injections can lubricate knee joints affected by arthritis, reducing discomfort. For knee pain caused by arthritis, the FDA recently approved a new, non-invasive treatment called cooled radiofrequency ablation. The treatment targets the nerves in the knee that send pain signals to the brain and interrupts them with radiofrequency waves. Studies found that pain relief from this procedure can last six to 12 months, depending on how quickly the nerves regenerate.